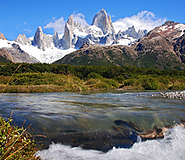 Discover El Chalten during your fully customizable Argentina vacation. All of our Argentina tours have daily departures and are covered by our price guarantee. 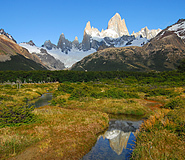 The indigenous word “Chalten” refers to the famous mountain at whose base the town rests: Mount Fitz Roy in English. This tiny town was founded very recently, in 1985, and has a disputed past. Both Chile and Argentina claimed the land upon which the town now sits as their own, and it was only a few decades ago that an international tribunal ruled in favor of Argentina. After its founding, El Chalten rapidly became a must-visit for trekkers and mountain climbers seeking to explore its spectacular surroundings. The town itself exists primarily because of the constant influx of keen mountaineers that flock to the region in search of adrenalin- inducing challenges. Thanks to this steady flow of visitors from throughout the world, the town has a variety of lodging options, restaurants, and other such entertainment, yet it still retains its rough-around-the-edges feel. El Chalten holds the unofficial title of Argentina’s National Trekking Capital, thanks to its unmatched proximity to spectacular glacier terrain enjoyed by campers, horseback riders, and of course, hikers. Easily accessible and nearby is the town of El Calafate. Charming and boasting an interesting history, as well as all the necessary facilities you will need, it provides another option for adventure activities on your Patagonia travel adventure. 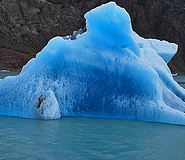 Parque Los Glaciares. Undoubtedly El Chalten’s principle attraction is the nearby Los Glaciares National Park, and there is a palpable spirit of adventure in the air as the many expectant adventure seekers gather nightly in the town’s numerous cozy bars and dining establishments before or after excursions. Climbing. The icy peaks of Mount Fitz Roy, Cerro Torre, and other formidable summits surrounding El Chalten draw hundreds of avid mountain-climbers every year. Towering at a dizzying height of 11,168 feet (3,405 meters), Mount Fitz Roy offers some of the best and most challenging climbs in the world. Trekking. Trekking enthusiasts find true paradise here, with picturesque trails along valley floors, none of the hazards and discomforts found at higher altitude treks, and very comfortable lodging available along the trails. You can either hike the trails on your own or hire guides to lead you to the best viewpoints, including some of the most beautiful lakes: Laguna Capri, Laguna Torre, and the striking Lago del Desierto. El Chalten is also known for its proximity to the majestic Viedma Glacier and lake, which you can explore either on foot or with a boat tour. The best time to visit Patagonia in general, and El Chalten, is in March-April right after the tourist season (which lasts approximately from November to March). If you want to avoid the crowds and wish to enjoy nature at its finest without being disturbed, this is the best season. The highest peak for tourism in the region is around January and February, when prices tend to increase. However, El Chalten is such a remote destination that not many make it so far. Even in the high season, you will find that crowds are not so large in this small town. You’ll be able to enjoy the beautiful Patagonian landscapes any time of the year. Be aware that weather in El Chalten is often unpredictable and very windy year-round, which can affect the possibilities for trekking and climbing. This was one memorable trip and your company made it smooth.. I would have never organize a trip like that on my own! I'll definitely use your company again and recommend it to my friends. Top notch operation. I would like to thank you from the bottom of our hearts for the job well done. Thanks again for your great work in planning our trip. At first, we were a little wary about using an online travel agent, but we had a great experience; it never felt impersonal, which we had feared. On the contrary, the service was always very warm, responsive, and accommodating, especially compared to other agents that we had contacted. You were very flexible about our scheduling, our budget, and dietary restrictions, and there was never a problem reaching you by phone when that was more convenient. I would gladly recommend Argentina for Less to anyone traveling to that region, and would use them again myself. We are back home from the trip. We really enjoyed Argentina. All the arrangements were good. We were very impressed with the All Patagonia travel agency. Overall I think the trip was well organized and I thank you for the quick turn around on a short notice. I would recommend your services to others. Hoping to work with you in the future. Under the slanted red roof of this cabin-style hotel you'll find the finest place to rest your head in the region. Wild grasslands surround the hotel on all sides while large windows offer views of the grasslands and the Patagonia mountains just beyond. 44 bedrooms vary in size and grandeur, with the best rooms equipped with king size beds, hydro-massage tubs, and boasting spectacular views of the Rio de las Vueltas. Services include a gift shop, common area with fireplace, salons and relaxation parlor. The bar has regional liquors, wines from throughout South America, strong cognacs and malts, plus Cuban and Dominican Republic tobaccos. If you're lucky, you might just catch a sunset during happy hour. The gourmet restaurant serves seafood, wild game, Patagonia stew and lamb, smoked and homemade cheeses, and specialty-crafted desserts, along with a long wine list. Located at the foot of Monte Fitz Roy and Cerro Torre, Hosteria El Puma offers comfortable accommodations to those wanting to relax after a long day of trekking Patagonia’s finest mountains. Beige walls, local brick, and soft cotton curtains and ironwork decorate the cozy interior. Comfortable and luxuriously appointed, the chic rooms all face the snowy peaks and boast spectacular views. The restaurant Terray serves exquisite “mountain cuisine,” from Patagonia lamb to rainbow trout, along with fine wines. Available services include laundry, room service, central heating, security boxes, wireless internet, and a fireplace in the lounge. The bilingual staff is always on the lookout to satisfy all guests’ needs and make sure they spend a pleasurable moment at the hotel. Located along the Rio de las Vueltas, the Hosteria Senderos boasts gorgeous teak wood exterior and a vintage farmhouse style. The 21 rooms are warm and inviting, with wooden furnishing and comfortable beds. Facilities include an American-style buffet breakfast, wine bar, reading room, a lounge with fireplace, room service, and laundry service. The helpful and courteous staff speaks English and is committed to satisfying guests' every wish.